People sometimes say how all these date’s have become so commercial but you know what, if these dates were never recognized nationally or throughout the world we might never take the time to say thank you to our nearest and dearest.. It doesn’t have to be a big expensive present nor does it have to be anything at all for that matter but, just take a little bit extra time on days like this to enjoy your Daddy’s company..
For those of you who like to bake a little,or, would like to give it a go,here I have included a delicious recipe for a gluten free Summer Sponge Cake which is sure to please everyone at the table, and on very special days like this it’s lovely that we can all enjoy the a cuppa and a slice together. Here at Cloughan Farm & Cookery School we’d like to take this opportunity to wish all the wonderful Daddys out there and their family’s & friends a very happy fathers day..
Preheat fan oven to 180oC. 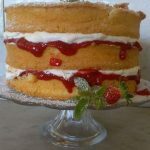 Grease 2 x 20cm cake tins with butter or margarine and dust with the gluten free flour shaking off any excess. Place the eggs in a bowl of luke warm water for a 5mins. Scald out the bowl of the mixer to remove any grease and dry with a tea towel.. Pour off the water from the egg’s and crack into your mixing bowl making sure not to allow in any shell’s. Switch on the mixer to full speed and after ½ minute add the castor sugar. Beat for 8-10 minutes or until the beater leaves its track when switched off. Sieve half of the flour’s over the egg mixture at first and gently fold in with a spatula. Once almost incorporated fold in the remaining flour and divide evenly between the two cake tins. Bake in the centre of the oven for 20/25 minutes or until the centre of the sponge springs back when gently touched with your fingers. Carefully turn out onto a wire rack to cool. For the filling, add the sliced strawberries into a saucepan over a gentle heat. Once the strawberries start ozzing juice, add the sugar and stir until completely dissolved. Place the cornflour into a small cup or bowl and blend with a few teaspoon of the hot strawberry juice from the saucepan. Add the cornflour back to the saucepan and continue to stir over a gentle heat until slightly thickened .Set aside to cool. Place one of the sponge’s topside down on a serving platter and spoon on the cooled strawberries. On the remaining sponge spread with the fresh cream and sandwich the 2 cakes together. 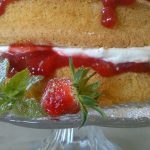 Dust with icing sugar and add a few whole strawberries to the centre of the cake with the sprigs of mint..
Slice at the table and enjoy!!!! Best baked and eaten on the same day.